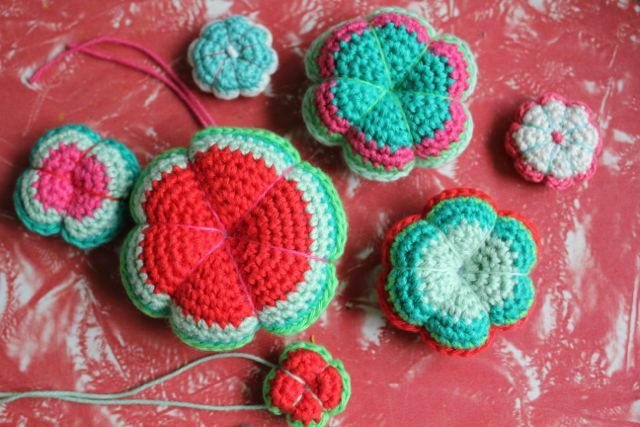 Would you like to make a little crochet tree ornament for Christmas? 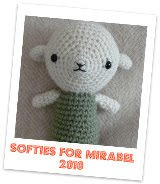 Thanks for the interest in this little make, I am happy so many people liked it! maybe a bit fiddly to put together, but not difficult at all. You could make these trees bigger or smaller depending on how many layers you make. each with a different amount of rounds completed to give a range of sizes. and the third layer 2 rounds less than that one (6 rounds), and so on. The bottom 4 were done like this, then for the top 3 layers that are quite small, I used a smaller hook (2mm or 1.5mm I think) and finer cotton till I had a size that worked in with where I was up to on my tree. If you want a bigger tree, you could start with a 12 round layer and go up from there, or for smaller tree start with 8 or 6 rounds. These are the colours I used for the 'Christmassy' one. And these are the colours for the pastel one. 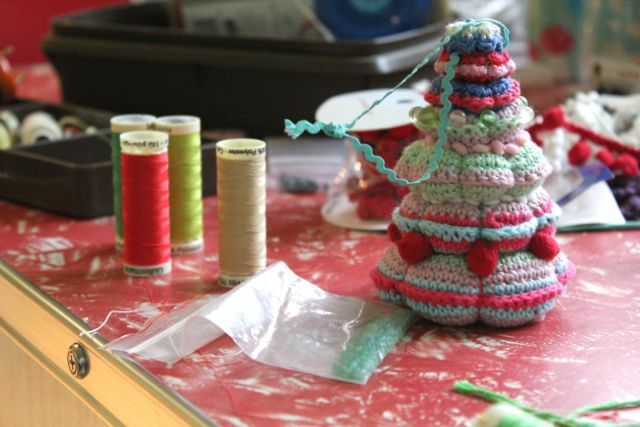 You will need a long needle to sew all the layers together, and sewing cotton in colours that match in with your tree. 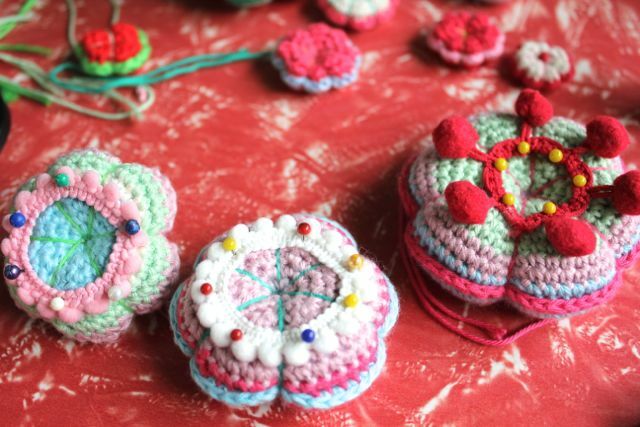 Once you have your layers all assembled, cut lengths of bobbly ribbon or pom pom trims, pin to each layer and hand sew in place. I did a fair bit of playing around with colours and different ribbons in between each layer until I was happy with the combination of layers and trimmings. Once all the trimmings are secure, use your long needle to sew the layers together, I found adding one layer at a time, sewing to the bottom layer, and then adding the next layer, worked well and made a nice solid tree. Before I added the top layer I sewed a loop of ric rac for a hanger,then sewed the top layer over it, which I think looks quite neat. 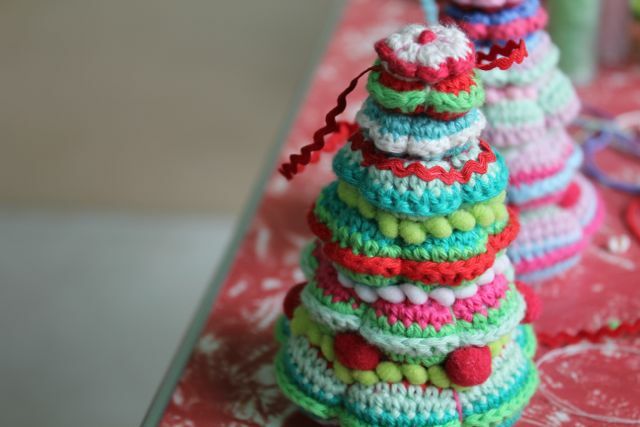 So there you have it, an easy peasey Crochet Christmas Tree! 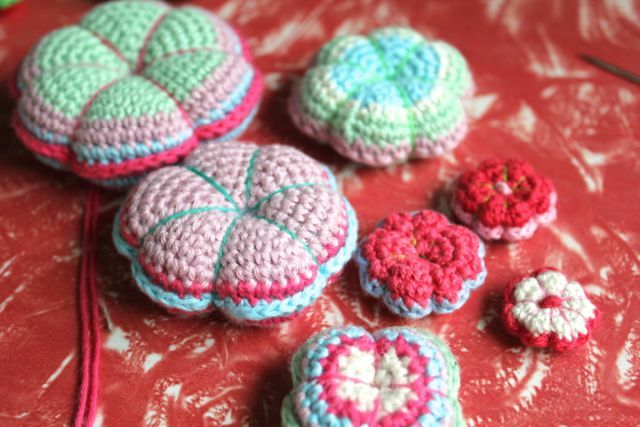 You could embellish these with lots of cute little things I think, you could add beads or little buttons, or do little picot edges around the rounds instead of sc. 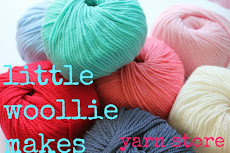 And they would look lovely made in a fluffy, fuzzy yarn I think! I hope you can have a bit of fun with this. I love it. Thank you for your great idee! What great little trees. Lovely design. 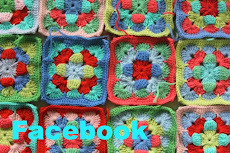 Vou seguir seu blog, amooo croche! Thank you for sharing! They are amazing! Thank you so much Jules, very very sweet from you to share this!!! They look wonderful. 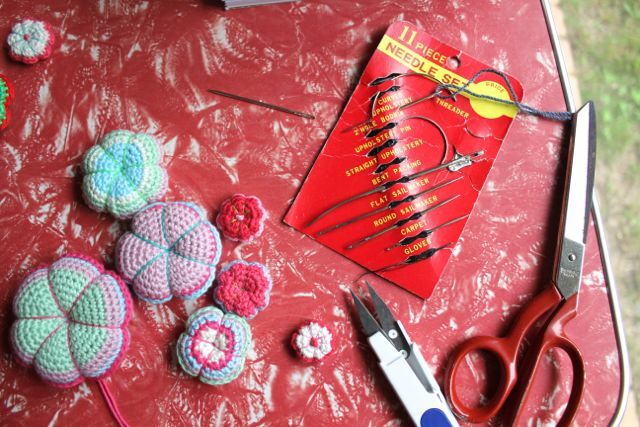 If I have time between now and christmas (unfortunately unlikely) then I'll definitely have a go! Lovely colours and I love the overstuffed look as well! Beautiful ! Great idea ! Thank you for sharing! Wonderful blog , its alway fun to look at. Me encanta este arbol!!! Es muy original. Just adorable!!!!! I love it. Awww, that's the cutest, Jules! Recently discovered your blog. Didn't know I was missing out on such awesomeness. Thanks!! So cute! Glad I found you! Can I follow you by having your posts sent to my email....can't seem to see how. 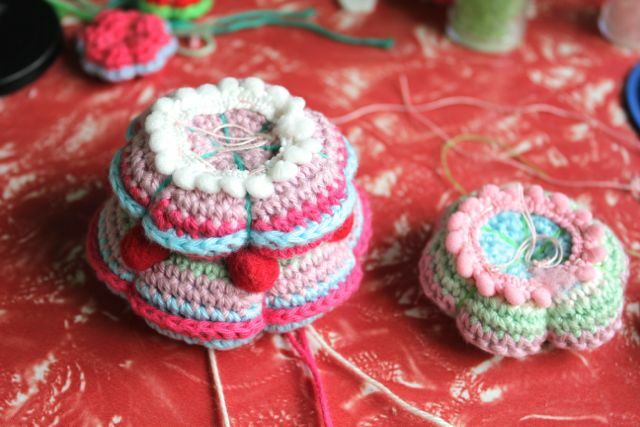 i spotted your tree over on christina's blog for the ornament swap - what a beauty. i love your colour combinations too! Awww that is sooo cute! Very crafty christmas ornament, I love it. Wow! I have no words. I love it!. You are so talented! Congrats. I know now what I am making for next Christmas! These are adorable!